The Head of the UGCC in Chicago: "His Beatitude Lubomyr knew about the appointment of Bishop Venedykt, rejoiced and awaited this day"
The UGCC gave birth to not only patriarchs but also to ethnarchs for the world, for example, such as His Beatitude Lubomyr, whom we proclaimed our national intercessor for peace in Ukraine. Many people, regardless of their denomination, were standing in lines in order to bid farewell to him. His Beatitude Lubomyr knew about Bishop Venedykt's appointment, was happy about it, and was waiting for this day. And today he is happy with us in God. He is with us. 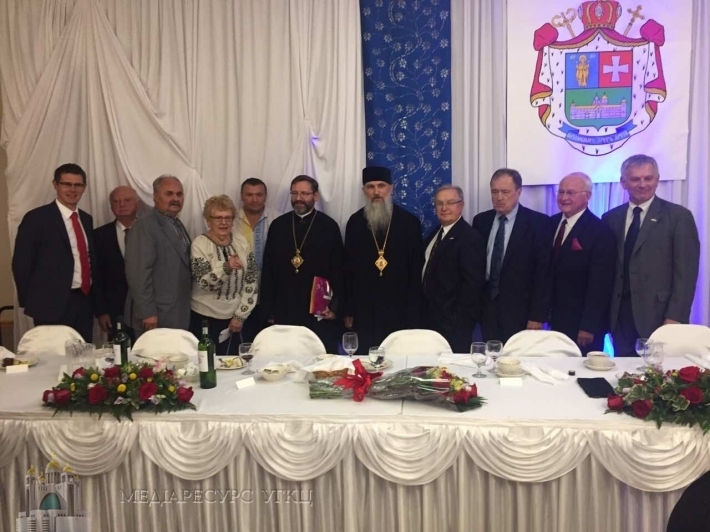 This was said by His Beatitude Sviatoslav, the Father and Head of the UGCC, during the solemn dinner after the Liturgy with the Enthronement Service for the bishop of the Eparchy of Saint Nicholas in Chicago His Grace Venedykt (Aleksiychuk). "This day is special because God has no any accidentals. Exactly on June 29, 1867 blessed Josaphat Kuntsevych was proclaimed a Saint of the Catholic Church, also, on this day a miraculous icon of Our Lady of Zarvanytsia was crowned," added the Primate of the church. Bishop Venedykt spoke about calling: "Monastic life – is a calling… God is calling. Why? For what? You don't know. God is calling you. I am feeling even today that I had this calling and chose it. Serving as a monk, a priest, a bishop, I tried to value people whom God was giving me." According to Bishop Venedykt, we are living until we awaken and encounter problems. "We cannot avoid problems. We are inevitably part of the problems. By the question is whether we use them as an occasion to do something good? Whether we are looking for the lessons which God wants to teach us in those problems? God, Who is Love, in every situation, problem and even sin, wants to teach us a lesson. That is why I thank God for my life, the only and unique, through which He is leading me. I don't know why God has led me here, but I believe that He wants to do something good here. I am not a Savior, but I came here so we could do something good together. It is not going to be easy and simple. But when we are working, the Lord will help us," emphasized Bishop Venedykt. The Bishop recalled how, during the funeral of His Beatitude Lubomyr, many kind words were said about him: "It hurt me a little. Why? I was thinking that His Beatitude Lubomyr had to die in order to be valued. We have to value people and see what they have unique and special. Ukraine will be strong only when our diaspora is strong, and diaspora will be strong when Ukraine is strong. I am grateful to God that at this period of my life I am here. I am waiting for your support and collaboration. We mustn't be afraid of problems! May God help us follow this road of trust to God." At the end, the Bishop Ihor, Archbishop and Metropolitan of Lviv, gave some advice to the faithful: "Respect the Bishop and love him. Build together our church here, care about it and live in peace among yourselves, help each other and grow in love. May God bless Bishop Venedykt and all of you."